Turgenev never really thought of himself as a dramatist, and certainly his plays date from early on in his career well before his reputation was made by a string of successful novels, novellas and short stories. 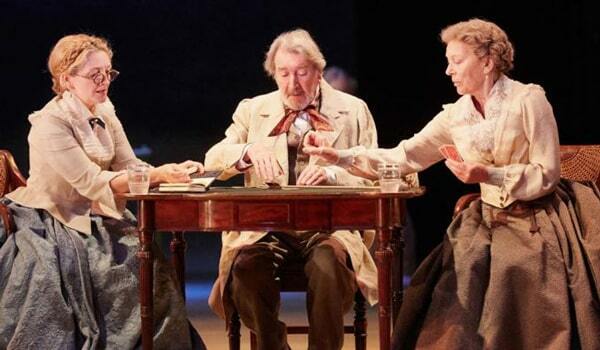 However, Chekhov was always adamant that Turgenev’s work and this play above all was one of the main sources of his own inspiration and method. One can immediately see why. Unlike, say, Tolstoy or Dostoevsky, Turgenev is not exploring the validity of huge philosophical principles or using his characters as protagonists or puppets on a cosmic canvas. He is instead concerned to observe the society of his day, its foibles and contradictions, and depict the joys and sorrows of the micro-society that was the country estate he himself inherited and spasmodically tried to administer from a distance. He assembles here a cast who were to become stock types in the later plays of Chekhov and others: the feckless landowner, the highly educated but frustrated country doctor or lawyer, the bored spoilt aristocratic wife and mother, the pedantic vain intellectual, the idealistic politicized reformer, the cynical, world-weary writer, the observant but faded lady’s companion, the stubbornly loyal or guileful servants, the talented, full-on young girls heading to sensible but unsatisfactory and stifling marriages. All these stock characters upon which Chekhov was to weave so many more complex variations are presented here in basic form.. not so much ‘sketches from a hunter’s album’, as humane, provisional notes on the inevitability of compromise and the diminution and disillusionment of idealism and hope that comes with age and experience. Chekhov pushes the stereotypes further into an ironic theatre of the absurd which the older author would not recognize; but as the play ends with the German tutor teaching cards to young Kolya, telling him that he will need all his ‘three hearts’ in the life ahead of him, you sense a baton being passed on…and perhaps a sly reference to Dealer’s Choice. A good deal of this refreshing energy is crystallised in the translation. Marber has dispensed with the traditional elegant and accurate version by Isaiah Berlin and worked up his own script from a literal text. 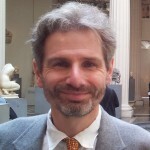 It has many of the virtues of Marber’s own writings: there is for instance close attention to class and social differentiation. These features were always there in the text but it is helpful to have them highlighted, particularly in the case of Shpigelsky and Belyaev, both low-born and seeking to be recognised on merit. This version is also simply so much funnier that what went before. Gone are the laborious repeated patronymics that held up the action, and instead there is comedy of wit and situation in abundance – a plethora of one-liners fizzing past together with those insightful paradoxes that you want to hear again to plumb their full depth. The interval is perfectly positioned between two scenes that capture the essence of Marber’s contrasting skills as an adaptor – the first is the crucial scene of romantic revelation where there is very little in the text beyond a formal surface, but great scope for actorly insinuation and implication by tone and gesture, and the second, which garnered the most laughs of the evening, is an exquisitely wrought dialogue-contest between Mark Gatiss’ doctor and Debra Gillet’s, Lizaveta. It’s a scene worthy of Wilde in its verbal dexterity and jousting, and a perfect foil to the high romantic seriousness of what went before. A reminder too that every kind of love and affection and unhappiness is under scrutiny here from different angles and with a full range of nuance, including farce and bathos. The design is both spare and detailed. The interior scenes are furnished in contemporary drawing-room style but abstraction and space beckon too. The central acting area is bracketed by a curtain of plastic flaps and in the background on three sides sit, like chess pieces, all the actors needed for that particular scene. In outdoor scenes there is a painted rural backdrop that could be loosely based on a period landscape by Chekhov’s friend Levitan, and within it a red door recurs – sometimes suspended in the air, like the kite that plays an important part in the action, and sometimes anchored on the ground to mark the entry to the barn where assignations take place. Marber’s point seem to be that this is not an environment with a continuum of entropy but a play in which decisions (to enter the door or not) have had and continue to have real consequences for these characters. The lighting design is achingly beautiful at times and contributes meaningfully to the mood of key scenes. Costumes are in period and delight the eye while not incommoding the actors. The acting is of a uniformly high technical standard with no weak links. All the minor characters seize their moments in the sun and the major roles are played in a considered fashion though I cannot agree with all the choices made. John Light and Lynn Farleigh, as the estate owner Arkady and his mother Anna, do their best with roles whose main function is not noticing what is going on. Gawn Grainger has some fine comic moments as the German tutor Schaaf, while also showing unexpected kindness beneath the crusty pedantry. Nigel Betts as the shy, elderly, rich neighbour, Bolshintsov captures the right blend of comic bumbling and shy panic, and among the servants Cherelle Skeete shows real presence and comic timing both sides of the green baize door. Gatiss and Gillett are outstanding throughout as the doctor-on-the-make and the lady’s companion whose beady eyes see through everyone. They also both have the skill to act an inner sadness through external comic display; so when they do not marry because ‘one kind of unhappiness cannot live well with another’, the ground has already been well prepared. While Natalya Petrovna is the leading lady, it is Vera her ward who is the positive emotional centre of the play. Lily Sacofsky rises to this demand superbly. One of the many poignancies of this play is to see how quickly her youthful idealism and optimism and love of being young is snuffed out by betrayal and rejection and angry recognition of her social restrictions. There is little time to display and make credible this enforced and embittering maturation and Sacofsky does it most affectingly. Her pain and inner toughness cross the footlights powerfully. Rakitin, the writer and ironist, is the most demanding role in the play. Beneath his genuine charm and affected, wry disengagement the actor has to find and excavate layers of self-knowledge and self-disdain and act as the moral compass for the action. It is an extraordinarily detailed portrait of a man who has nursed an unrequited love for years from which he unable to break away despite his intimate awareness of the toll it has taken on his life and the unworthiness of the woman he adores. John Simm captures the guilt, melancholy disappointment and frustration on the one hand and his essential kindliness and desire to please on the other. In voice and deportment you sense his charm and sophistication and the wisdom of the man whom Natalya ought to have married but did not have the self-knowledge to choose. 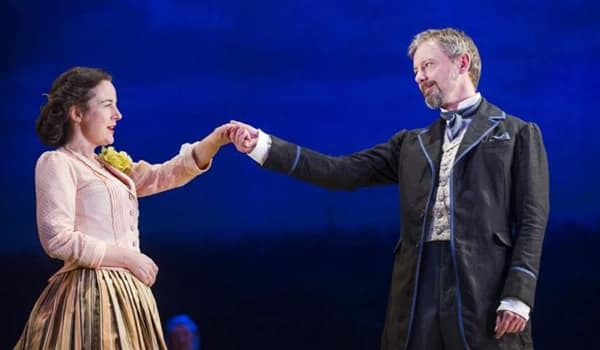 In effect, Simm has to play Turgenev’s own role and he does it with real style and deft restraint – with one exception….. So given my admiration for the production, the translation, the setting and many of the actors, why only four stars? The answer lies with three reservations about the performances. As Belyaev, the charming idealistic tutor who captivates Natalya Petrovna, Royce Pierreson certainly looks the part and has the physical energy, and combination of brash self-confidence and gaucheness the role needs. But over and above that he should have an overflowing exuberant transgressive love of life (we first hear of him riding around on the back of a cow! ), if we are to understand why Natalya finds him so irresistible. He represents the external embodiment of all she feels prevented from doing. If we do not see that then we do not get to comprehend why Natalya is prepared to risk her status and respectability, and why Vera also abandons all caution and dignity in her dealings with him. For all his general excellence in the role, Simm misreads Rakitin’s crucial speech to Belyaev near the end of the play in which he abandons his various poses and speaks from the heart about the dangers of getting close to Natalya. He explains how he has wasted his life and abilities in a vain pursuit of a hopeless love and warns Belyaev of the consequences of romance pursued heedless of the social consequences. Simm allows himself to become overwrought and to break down as he speaks openly of his feelings. This is very well done technically and works in the moment but it still seems a mistake to me for two reasons. Firstly, it is a historical and mannerly error: no aristocratic Russian would have ever let himself go in this way in front of a relative stranger and someone of lower social class. And if that were not dispositive, then experience shows that in this sort of speech less is more, both in delivery and in providing a plausible explanation for why it is so persuasive for Belyaev’s later course of action. Back in 1994 John Hurt was totally compelling in this speech simply by switching from the laid-back literary drawl he had affected up to this point to his normal voice delivered with great precision and intensity and pacing. That was all that was needed to suggest the emotional devastation of twenty wasted years. It did not need to be re-enacted or over-acted. Finally, and most importantly, Amanda Drew’s portrayal of Natalya Petrovna has yet to find its full range and layering. She is successful in capturing her petulant boredom, fear of ageing, jealousy of youth, and capricious desire for both continuous stimulus and support. However, the role needs more light and shade: light in the sense of our needing to understand why she is such an alluring figure to both men and women in this play; and dark, in the sense that we need to feel the truth of Rakitin’s barbed comment that her refusal to allow anyone to love her can only be explained in terms of a desire to preserve the purity of her own self-hatred. Again, the benchmark performance for me comes from Bill Bruyden’s 1994 production where Helen Mirren found a seductive, mercurial ‘infinite variety’ in the role akin to Cleopatra’s, while also revealing a deep self-lacerating awareness of her own machinating shallowness. So often the press night comes too early in a run to fully assess a production’s potential. This welcome and ambitious new version has not yet attained greatness but certainly has the makings of it. 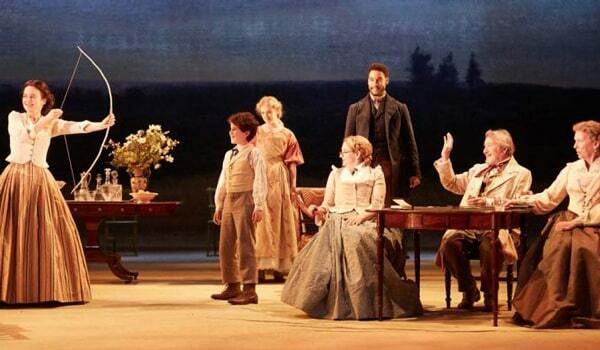 Three Days In The Country runs at the National Theatre until October 21 – Book Now!